My sister Gail brought it to a family get together recently and my kids loved it so much that it has become one of our family favorites. (Have you seen our family favorite meals list?) She made up this recipe herself based on a salad she had at a restaurant and then I added a few things here and there, because I can never leave a recipe alone, ya know. Just guess on the amounts for, because it all depends on how many you're serving. 2-3 bunches of organic romaine lettuce – lettuce is one of the “dirty dozen", so I always buy that organic. 1 cup cherry tomatoes, halved – these are right in the middle of the list, so I still buy them organic, especially because our local grocery has some that are SO delicious. Add a pinch of cayenne pepper if you want it to have a little bite! Toss everything together but the avocados. I serve that separately because a couple of the kids don't like it, PLUS if you have any left you can squeeze lemon juice on top to keep it from turning brown, then cover it and stick it in the fridge so you can eat the rest later. 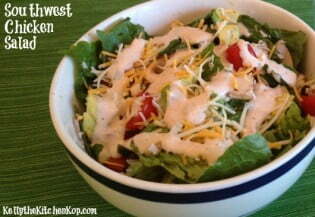 Whisk your dressing ingredients together and drizzle on top of the salad when you're ready to serve. Busy? Always on the go? 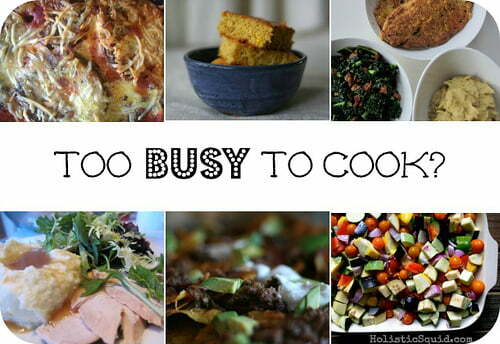 Check out how you can save time and still eat well. Yum! Think I’ll be topping mine with homemade baked tortilla strips. I’ve got to stop looking at recipes on people’s blogs! I’m getting hungry! YUM!! 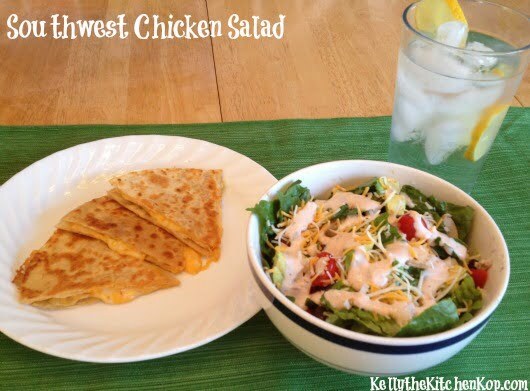 This looks so good, Kelly! My kind of dinner, especially as the weather warms up! What I love about these kinds of dinners is that everyone can personalize their salads to their own tastes–what types of toppings, etc… to put on theirs.